We recently hired a new Jr. SQL Developer and she started yesterday. She is fresh out of college with no real world experience and little SQL experience. We knew what we were getting into. We had the budget and job description for a Jr. person and we wanted someone who was passionate about learning more about SQL. We chose this person precisely because she was so excited about learning database development. We now had a slight problem. What do we do with someone this inexperienced? We decided that for the first month, the mornings would be used to learn our environment, where things are, what the processes do, etc. The afternoons would be for her to study for the 70-433 SQL Developer Exam with the resources necessary to try all the exercises in the book. Instead of immediately expecting her to start offloading work from us, we figure that educating her as she is getting lab experience would be our best long-term strategy. I am excited that I can directly take part in this opportunity to begin someone’s professional career. Ask yourself what could you or your company do to start or improve the career of an eager young mind. This entry was posted in Uncategorized on July 13, 2010 by lotsahelp. Your logo needs to link to Robert's blog post. 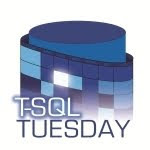 Sorry, I meant the T-SQL Tuesday logo.